However, as I’ve gotten old older, I find myself accepting my femininity much more than I ever have. I’m not at all saying that being in a dress over a pair of jeans epitomizes femininity by any means, because it doesn’t; but because of my resistance to them – I’m attributing this recent development to finally giving in to the fact that I’m becoming more comfortable in my own skin. I still don’t own as many dresses as a typical woman might at my age, but as I’ve hit a recent new chapter in my life, I’ve felt a sudden shift in my relationship to them. I appreciate the different shapes of a dress, the movement, the ease; and yes, even the new-found comfort that I get in exchange. While part of me will always be a jeans girl at heart, it’s nice to not have the waistband digging into your stomach (because you’ve had one cupcake too many) or experience the constraint that you just deal with while wearing a pair of cute skinnies in the name of fashion! Even better, I’ve come to love how a simple change in styling/accessorizing can take a dress from weekend casual to office chic (by easily adding a blazer). 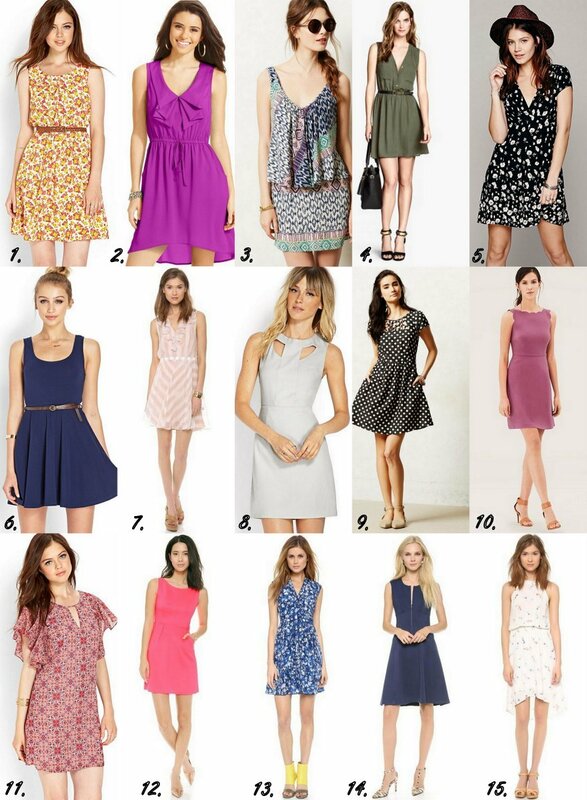 There’s an incredible versatility when you have a good dress in your closet. And thus, I’ve been coveting a new dress (showing my legs and all) lately. Go figure! In an ideal world, they’d all be in my closet ready to greet the sun and celebrate the warm days ahead. In reality, a post dedicated to getting “dressed” will simply have to do. Here are 15 of my absolute favorites, at a variety of price points – because let’s be real – who in the world can actually afford a $400 dress most of the time (and I hate when bloggers only showcase high-end designers).